We have a copy machine for teacher use, but it may be haunted or demon-possessed like the mangler from the film with the eponymous title. I have used it exactly 12 times this year (I usually make all of my copies during the weekend), and the copier has broken down or become massively jammed exactly 11 times. 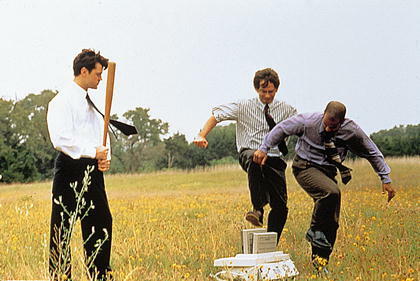 I feel like Michael Bolton in Office Space and want to give that copier a piece of mind (and my baseball bat). This entry was posted in Frustration, Good Mood on November 3, 2013 by drpezz. This entry was posted in Frustration, Grading on October 23, 2013 by drpezz. When I conducted the activity I mentioned a couple days ago, one of the anonymous questions surprised (and interested) me. A student asked: do you really care about your students’ educations or are you just here for the paycheck like my teachers last year? However, in my head I thought that this was a student who hears bad things about teachers at home or had a very poor Freshman year experience at my school. I’m not sure which I hoped was the answer. In truth, I’m guessing this student had a sad alignment of our least effective and driven teachers. We all know who the teachers are who would rather be buddies with kids than authority figures, those who want to be the new Video King, those who want to do as little as possible, and those who simply work the minimum number of hours and go home. Every school has them, and we would lobby to get our own kids into different teachers’ classes. What saddened me, though, was this was a student who even thought that teachers perform their jobs for the money without caring about kids. How can a teacher not care about kids? It’s anathema to every piece of my teaching philosophy. Day 4 of the school is tomorrow, and I want to start changing that student’s view on education and teaching. This entry was posted in Frustration, That Kid on September 4, 2013 by drpezz.